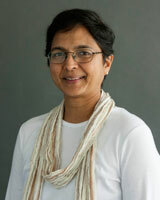 Kumudini (Kumi) Abeysuriya joined the Institute for Sustainable Futures in February 2003 as a PhD candidate, and since submitting her thesis in July 2007, has been working as a Senior Research Consultant at ISF. During her candidature she also worked on a small number of ISF projects related to energy, water and sanitation and international development on a casual basis. Prior to joining ISF, she worked as a consultant in the New South Wales energy utilities sector with a focus on sustainability-related issues. She co-founded the green energy advocacy venture EarthWatts, and was jointly responsible for providing thought leadership for establishment of the Australian Green Electricity Market (GEM). Kumi's PhD thesis examines how urban sanitation in developing Asian countries may be resolved in a manner aligned with sustainability. She proposes that resolution is predicated on treating the problem as a 'complex' one, and uses transdisciplinarity as a research approach. Her thesis draws on a range of disciplines including thermodynamics, ecological economics, Buddhist economics and deliberative democracy to develop guiding principles and a deliberative decision-making framework based on soft systems methodology. Kumi holds a Master of Science in experimental physics from Cornell University, USA, and a Bachelor of Science with first class honours in physics from the University of Peradeniya, Sri Lanka. This paper will explain how a framework derived from systems thinking, including soft systems methodology and the use of action research as a methodology, shaped a research project addressing an area of application (sustainable sanitation). The research used F (intellectual framework) M (methodology for using F) to address A (area of application) for understanding rational intervention in human affairs proposed by Peter Checkland in the 1980s. This Australia-first research project was conducted by a multidisciplinary team of collaborators from academia, industry and government that included researchers, practitioners and students. It explored the use of innovative urine-diverting toilets in an institutional setting. The paper is focussed on the initial stages of the project—the project design and early investigative phase, and demonstrates how systems thinking and a transdisciplinary research approach were used to structure a complex problem related to sustainability, a problem that infringed on social and cultural issues. best met the weighted criteria and satisfied their objectives. Fam, DM & Abeysuriya, K 2011, 'Toilet talk', WME Magazine, vol. 22, no. 4, pp. 32-32. The recently completed Lower Hunter Water Plan identified a portfolio of drought response measures to ensure that the region does not run out of water under severe drought conditions. A multi-criteria decision analysis (MCDA) process was developed to guide the assessment of the drought response options against multiple criteria (both quantitative and qualitative), and for the assembly and analysis of drought response portfolios. The process guided stakeholders in considering a wide range of alternative supply and demand side options, and allowed for the transparent trade-off between options or portfolios of options. The MCDA process integrated the assessment of social, environmental and risk/resilience criteria with cost effectiveness analysis. The process also included the analysis of contextual uncertainties and risk to determine the flexibility of the options under different future situations. The outcome of this process revealed a portfolio of drought response options that best met the weighted critieria and satisfied the drought response objectives. Sankaran, S, Abeysuriya, K, Gray, J & Kachenko, A 2010, 'Closing the loop: A systems thinking led sustainable sanitation project in Australia', 54th Annual Conference of the International Society for the Systems Sciences 2010: Governance for a Resilient Planet, pp. 346-358. This paper will explain a research project being carried out in Sydney, Australia at the University of Technology Sydney (UTS) highlighting the systems thinking principles and action research methodology being adopted in this project. UTS is set to participate in an Australia-first research project, led by the Institute of Sustainable Futures (ISF), exploring the use of innovative urine diverting toilets in an institutional setting. A UTS Challenge Grant (an internal grant scheme to promote innovative collaborative research) has been awarded to the project which will enable safe nutrient capture and reuse from urine diverting toilets installed on campus for a trial period. The Challenge Grant has some enthusiastic industry partners including the local water utility Sydney Water; the sanitary-ware manufacturer Caroma Dorf; the Nursery and Garden Industry Australia; government partners (NSW Department of Health, and City of Sydney) and the UTS Facilities Management Unit. Researchers from the University of Western Sydney and University of New South Wales in Australia as well as Linkoping University in Sweden are collaborators in this research. Waterborne sanitation using flushing toilets and sewer networks has been recognised as the most important medical milestone for its transformational impact on urban public health since the 19th century (Ferriman 2007). While this model of urban sanitation has become the accepted norm for the industrialised world, its cost and resource-intensive nature is increasingly recognised as unsustainable. Several alternative models offering improved sustainability through greater material efficiency have emerged (West 2003). One of these is urine diversion (UD), the topic of this paper. Mukheibir, P. & Abeysuriya, K. Institute for Sustainable Futures, UTS 2013, Multi-criteria decision support framework for the Lower Hunter Water Plan: Process, options and portfolio assessments, Sydney, Australia. Abeysuriya, K., Langham, E. & Fane, S.A. Institute for Sustainable Futures, UTS 2009, Water reuse feasibility project: water sensitive urban design opportunities, pp. 1-146, Sydney, Australia.